​There's nothing more frustrating for a business leader than to hear the team claim that they can't use Salesforce to track their customers and prospects because they "don't know how." When a teenager claims that they can't put away their laundry, load the dishwasher, or take out the trash..most parents respond with a swift and thorough lesson - promptly eliminating these excuses. 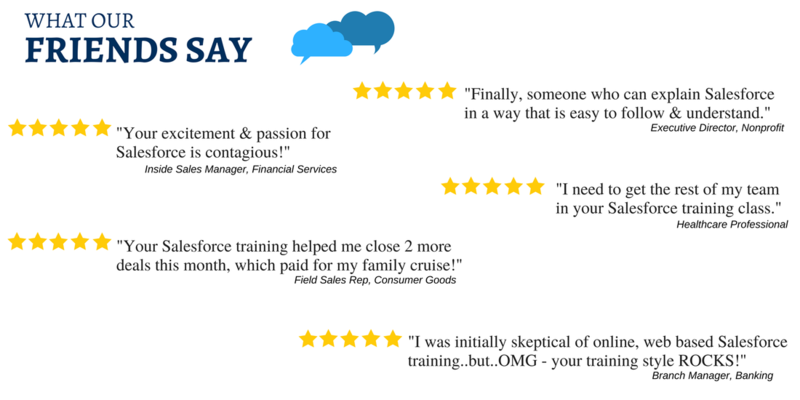 We take a similar approach to training your team on how to use Salesforce. If they can use a smartphone...we can teach them how to use Salesforce. This hands-on classroom style training course is what most people think of when they think of training. We come onsite to join your team in the same room, with the instructor at the front of the room, displaying Salesforce live on the projector, while each participant is logged into Salesforce, following along with each step being demonstrated by the instructor. This method of training is most appealing to many organizations as it facilitates in-person collaboration, networking and lively discussion around business processes and various challenges faced by the team. As much as we love technology, there's definitely an element of in-person, face-time that simply cannot be replicated over the phone and web. This hands-on virtual style training is like a live, interactive webinar. Participants join the training sessions through any internet connection and a conference call line. The instructor shares their Salesforce screen for all participants to see. Each participant is expected to be logged into Salesforce, following along with each step being demonstrated by the instructor. This method of training is most appealing to organizations that find it daunting to attempt to bring large groups of participants together to one physical space at the same time. The beauty of the virtual training option is that it eliminates the logistics and expenses of bringing everyone into the same room, while also allowing us to leverage technology to capture a crisp, high-quality recording of the session to share with those who couldn't join the live event. Virtual training courses are facilitator-led programs delivered via an online platform like Zoom, GoToMeeting or WebEx. While most of our virtual classroom courses consist of one segment, some include as many as six.